If you’re staying in Seattle, Wa this weekend come to Emerald City Comic Con!! Doors open at 10am on Thursday thru Sunday! I’ll be exhibiting in Artist Alley, table W14. 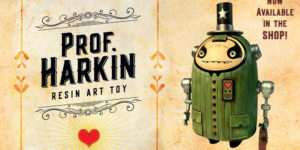 My new Resin Art Toy: Prof. Harkin is now available in the SHOP section! Get him while supplies last… Only 250 were made of this exclusive collectible art toy. The Angry Birds Movie artwork.